When it comes to looking through images, Google’s layout of rows is much better than Pinterest’s layout of columns. Google is very organized and easy to scroll down and look at all the images in a sequential manner. The rows keep all the various images in order. The Western world reads left to right, so Google’s rows of reading left to right fits right in with how we read. Pinterest’s column format clashes against our normal reading structure. The column format may work for languages that are read top to bottom, but for Western cultures, the column reading format is alien to us. Pinterest always feels like a jumbled collection of images. Scrolling through images on pinterest is a helter-skelter method of randomness. There is no easy order to scan the images. This dilemma is like shopping for greeting cards. Often customers will initially take a random approach to cards. Our eyes will scan all over the cards to see what stands out. However, eventually this approach is tiring, much like the random scanning that Pinterest demands. A more methodical approach would be to scan greeting cards row by row. It’s more efficient. You don’t have to re-look over cards you already scanned. Random scanning is much more fun, but it’s not sustainable. I can only do it for a few moments, just like Pinterest. I can look at a Pinterest search for about five seconds before giving up. However, a Google Image search is so easy and pain-free. 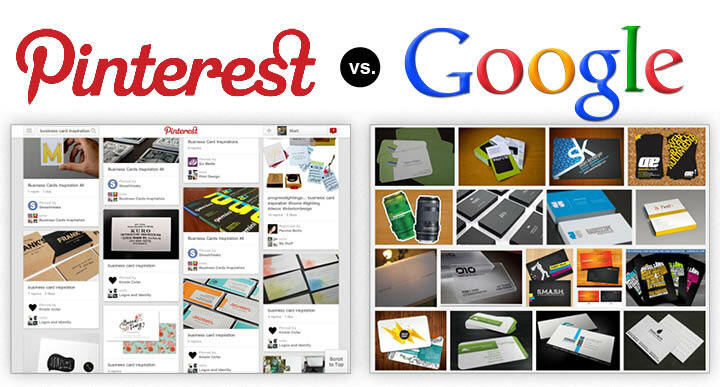 Pinterest’s design only works in that it’s a new different way of browsing images online. However, the newness will eventually fade out in favor of a presentation that is easier to browse, like Google Images layout. Give it a try. Do an image search on Google for business card inspiration. And a search on Pinterest for business card inspiration. Which layout do you enjoy more?